Acquired by Marlon Brando in 1966, Tetiaroa, THE island of all islands, the former island retreat of Tahitian Kings, is an atoll adorned, protected area, with 12 motus (islets), surrounded by a vibrant, annular reef, and only accessible by Air Tetiaroa private flights. 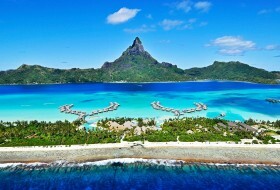 Contemporary and elegant, Le Meridien Bora Bora is a luxury resort set on a magnificent islet surrounded by the most beautiful lagoon in the world, with stunning sights over Mount Otemanu. With a subtle combination of Polynesian tradition and the most modern facilities, the resort is the perfect place for a luxury relaxing stay in paradise. 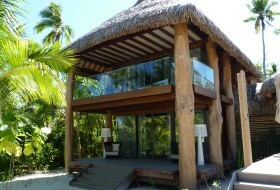 It offers the most sumptuous villas with the best lagoon views. 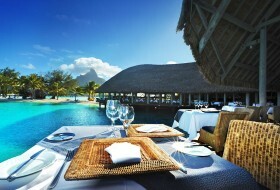 The St. Regis Bora Bora Resort is one of the few reference establishments on the island since its opening in 2006. 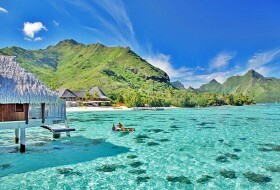 Located on an islet facing Mount Otemanu, the InterContinental Bora Bora Resort & Thalasso Spa stands out for its modern design and its Balneotherapy & Thalassotherapy center : unique in French Polynesia, under the renowned Algotherm trademark, it has been designed by Dr Treguer who created Monaco's thermal baths. 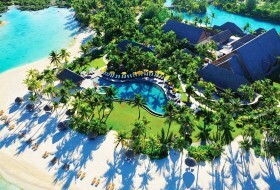 Situated between the deep blue Pacific and the tranquil lagoon, the Four Seasons Resort Bora Bora offers South Seas escape on its own sublimely private small islet. Inspired by Polynesian architecture, the village-like Resort blends into a lush world of unsurpassed tropical beauty and takes full advantage of heartstopping views. 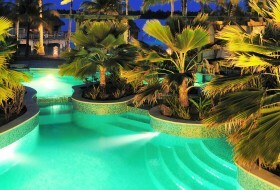 The ultimate in luxurious seclusion, the Four Seasons combines thoughtful service and impeccably modern amenities.